An Israeli airstrike on the home of Gaza's police chief killed 18 people and injured 45 others on Saturday, according to Gaza's Health Ministry. It was the deadliest day since Operation Protective Edge began, with the death toll soaring to over 150. Police Chief Tayseer Al-Batsh is said to be in critical condition and the majority of those killed are family members, Reuters reported, citing a Hamas member. An Israeli military spokesman is reportedly looking into the claims. 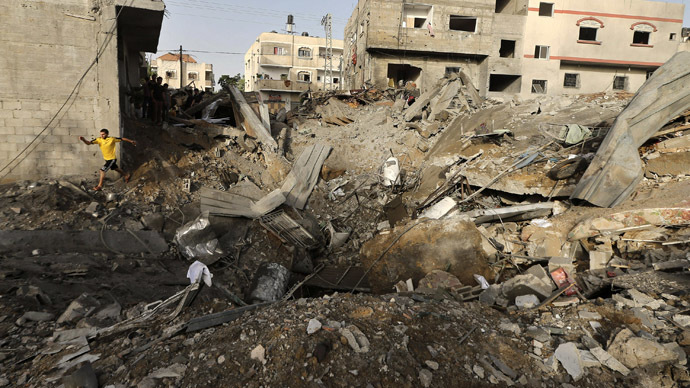 People are still trapped under the rubble, according to Gaza Health Ministry spokesman Ashraf Al-Qidra. Rescue workers are continuing their search operations. Israeli airstrikes on Gaza killed 52 people on Saturday, making it the deadliest day of the offensive. Among the dead were two severely handicapped women in a care facility, AFP cited medics as saying. 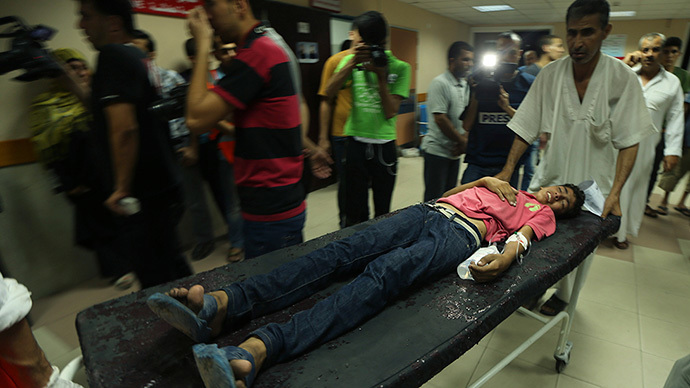 The total Palestinian death toll now stands at 157. Early on Sunday, Israeli navy commandos clashed with Hamas fighters as they carried out a raid on a missile launch site in northern Gaza, the Israel Defense Forces said. The Israeli Air Force hit 235 terror-related targets in the Gaza Strip on Saturday. Since the start of the offensive, Israel has hit more than 1,000 targets in Gaza. 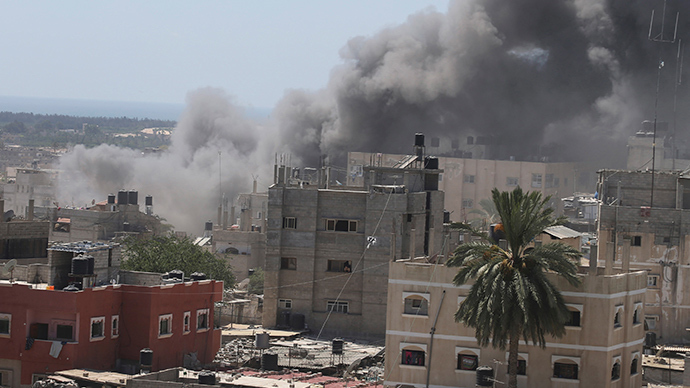 On Saturday, the Israeli military targeted a house belonging to the sister of Hamas political leader Ismail Haniyeh, killing two of his nephews and four other people. In another incident, locals reported that a mosque was bombed in the central Gaza Strip. The IDF stated that the mosque was used as a cover to hide weapons. A total of eight other mosques and 537 houses have been either damaged or destroyed in Gaza, according to the Gaza-based Al-Mezan Association for Human Rights. Meanwhile, Hamas bombarded Israel with the most rockets on Tel Aviv since the start of Operation Protective Edge on Saturday. 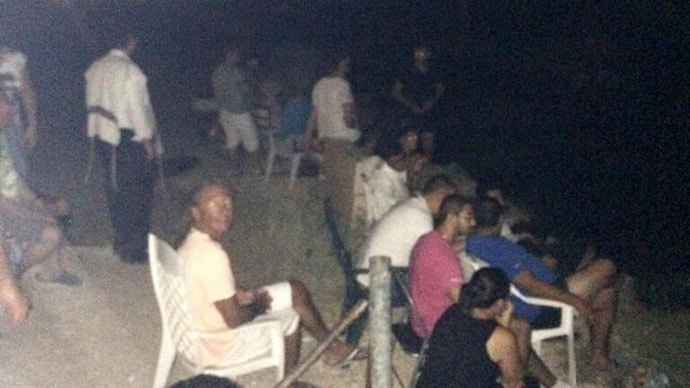 The group took responsibility for firing ten rockets at Tel Aviv, which caused no casualties or damage. The IDF said 140 rockets were fired at Israel from Gaza on the fifth day of the operation. A total of 107 rockets hit Israel, and 27 were intercepted by the Iron Dome. Israel has so far ignored international pressure to deescalate tensions and signaled that it is keeping its options open for a ground assault. So far, Israel has mobilized around 20,000 reservists. Israeli troops have been told that they might be entering the Gaza Strip in the next few days, Israeli Defense Minister Moshe Yaalon said on Saturday. "We are attacking and destroying weapon storages, militants' homes, armaments, launchers, rockets...the damage is great and it grows as time goes by, but it may not be enough, we may need a substantial ground operation," Yaalon said on Facebook. The UN Security Council called for a ceasefire between Israel and Palestine on Saturday, citing serious concerns about the protection of civilians on both sides. "The Security Council members called for de-escalation of the situation, restoration of calm, and reinstitution of the November 2012 ceasefire," the 15-member body said in a statement. But Israel said that a truce is not in the cards as long as Hamas continues to fire rockets. "There are no serious contacts toward a truce. There are many proposals, but as long as Hamas keeps firing, Israel will keep fighting and will not discuss a truce," a government official said, as quoted by Reuters. Hamas, on the other hand, said that it intends to continue to defend its borders. "We will not beg for calm and we continue to defend our people. Once we are offered a genuine, coherent and serious proposal, we will look into it,” Hamas spokesman Sami Abu Zuhri said. Meanwhile, Kuwait has called for an urgent Arab foreign ministers meeting on Monday “to discuss the deteriorating situation” in the Gaza Strip, Arab League permanent representative Aziz Rahim Al-Daihani told AFP. Hamas has urged Gaza’s residents to ignore the IDF’s call for the evacuation of specific areas that are about to be hit. This comes in response to an Israeli military message released earlier on Saturday, which called on Palestinians to leave the northern Gaza Strip.